This recipe is one the whole gang will love. I served it at one of our regular Sunday night dinners and it was a big hit. Preheat oven to 375ºF. Grease a large casserole dish with olive oil. Place cubed chicken on the bottom of the casserole dish. Lightly season with salt and pepper. 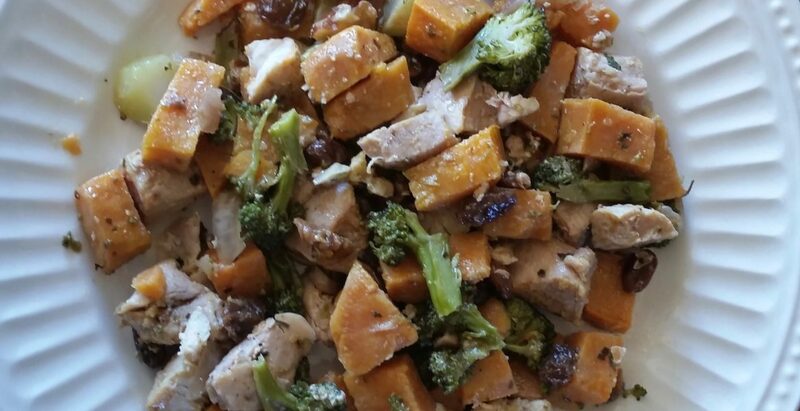 In a bowl combine broccoli, sweet potatoes, red onion, garlic, raisins, chopped walnuts, olive oil and herbs. Toss to coat. Top the chicken with herb and vegetable mixture. Cover with foil and bake for 35 minutes. Remove foil and bake for an additional 10-15 minutes or until chicken is no longer pink and the sweet potatoes are soft. Top with optional cheese just before serving.